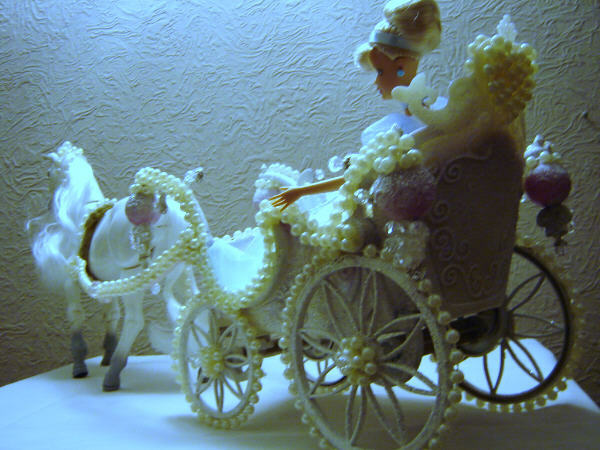 Cinderella Pumpkin Carriage (large size shown here), including Princess Cinderella and the Prince and two horses. 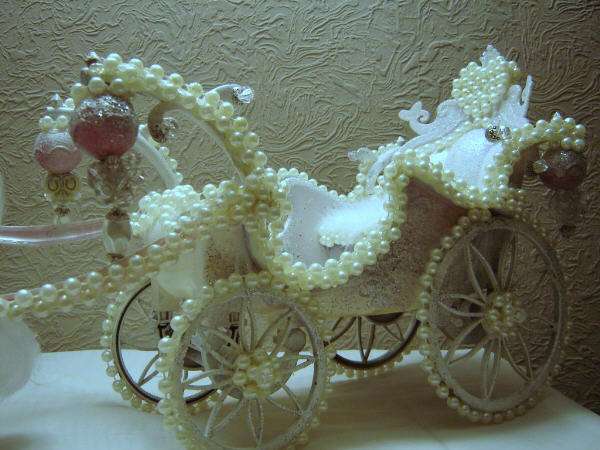 The coach is decorated in faux pearl beading, sheer organza ribbon and feathers. 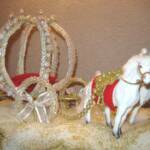 Cinderella Pumpkin Coach and Horses Measurement 10 inches high X 18 inch wide. 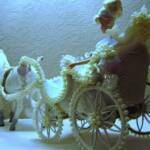 Includes Cinderella and the Prince. 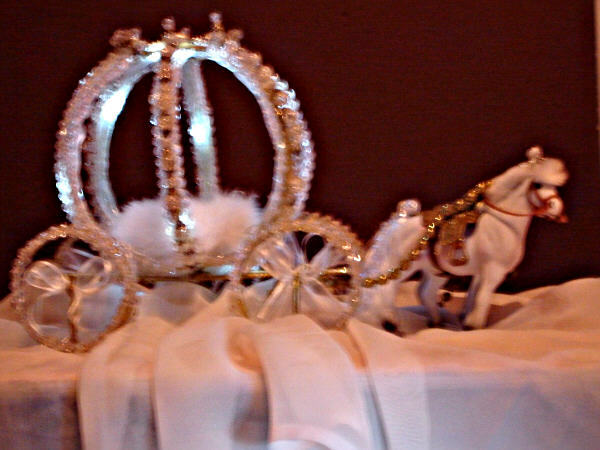 Centerpiece Price was $89.00 NOW $69 (USD) plus $12 shipping (UPS 5-7 day ground) within the continental United States. This coach may be ordered in small, medium, or large. Large size shown here. One currently available to purchase. Large pumpkin measures 10in.H x 11in. (Front to back) x 7in. (Across) and 8Dia. (Pumpkin Diameter) 2.5 in. Top Opening . Medium pumpkin coach measures approximately 4 inches in height and makes a beautiful centerpiece or cake top. Small pumpkin coach measures 3 inches in height. 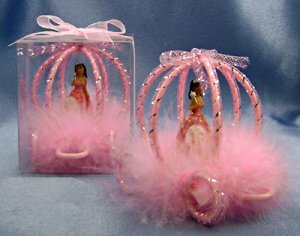 Great for wedding and quinceanera favors. Please let us know the expected delivery month/year and the quantity if you need more than one Cinderella Pumpkin Coach. Please let us know if you would like to add a base or lights to this pumpkin coach centerpiece. We will be happy to quote you a price. 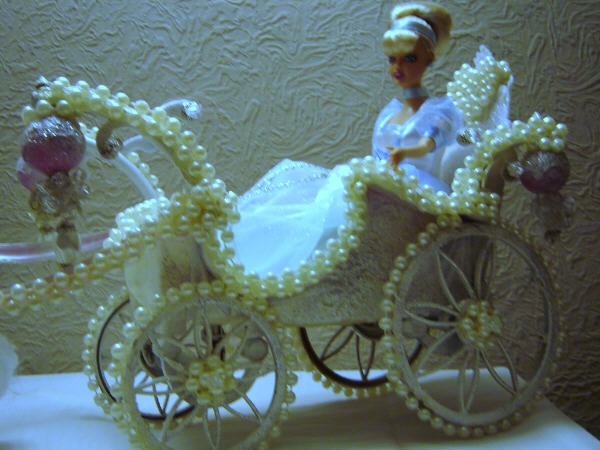 Decorated Princess Cinderella Open Carriage trimmed in pearl beading and crystals. 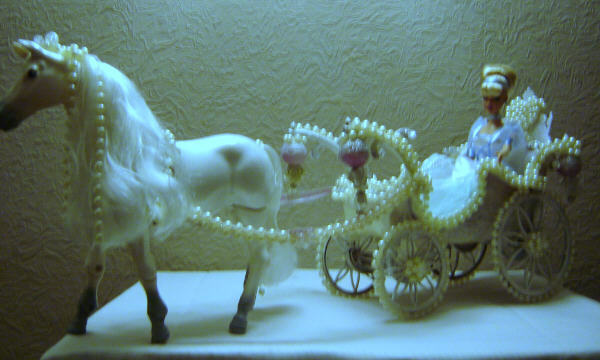 Includes horse and 11inch Cinderella doll. 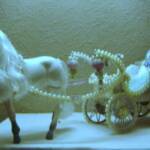 Rose colored lamps on front of carriage light up. Batteries come installed. 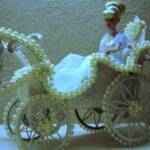 Cinderella sits on a cushion of white faux feathers. 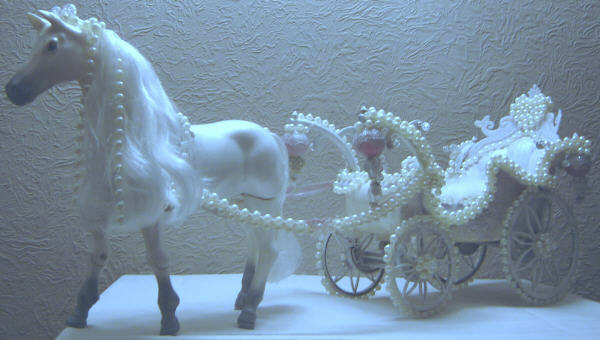 Carriage, horse and doll, are made of plastic. 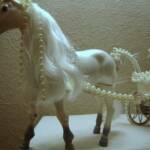 Horse is white with pearl beading adorning its mane. Display may be placed on any hard, cool, surface. Does not come on a base. This is not a toy, and should not be within reach of small children. Was $169.00 NOW $149.00(USD) including 7 day ground shipping within the continental USA. If you would like this display mounted to a base, please feel free to contact us with your suggestion. We will be happy to quote you a price, which will be determined by the kind of base you request, as well as whether or not it adds to the overall cost of shipping. 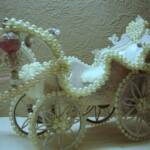 Please inquire about custom designs. 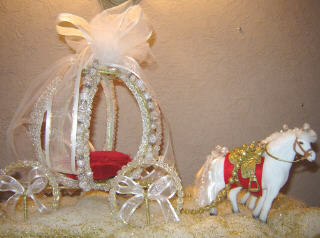 If you would like to customize the above carriage or if you have questions, please contact us. 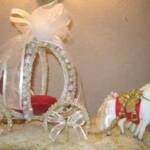 Please contact us about availability if you would like to place an order. 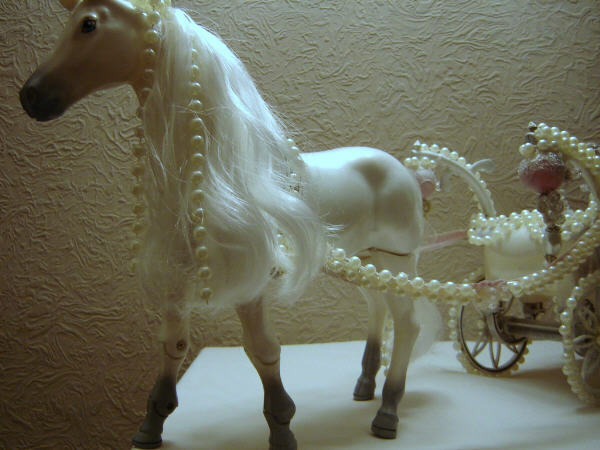 Please let us know how many carriages and when you would need delivery on your order. 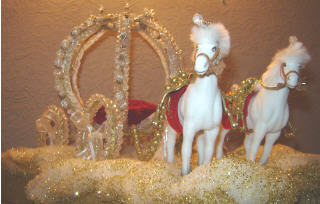 Cinderella Pumpkin Carriage (large size shown here), including two horses. 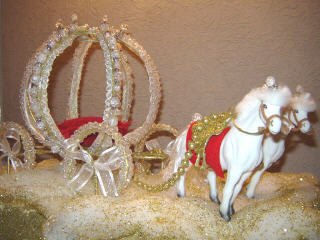 The coach is decorated in faux crystal, and gold beading, sheer white organza ribbon and red velvet. 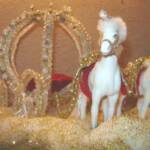 Cinderella Pumpkin Coach and Horses Measurement 10 inches high X 18 inch wide. 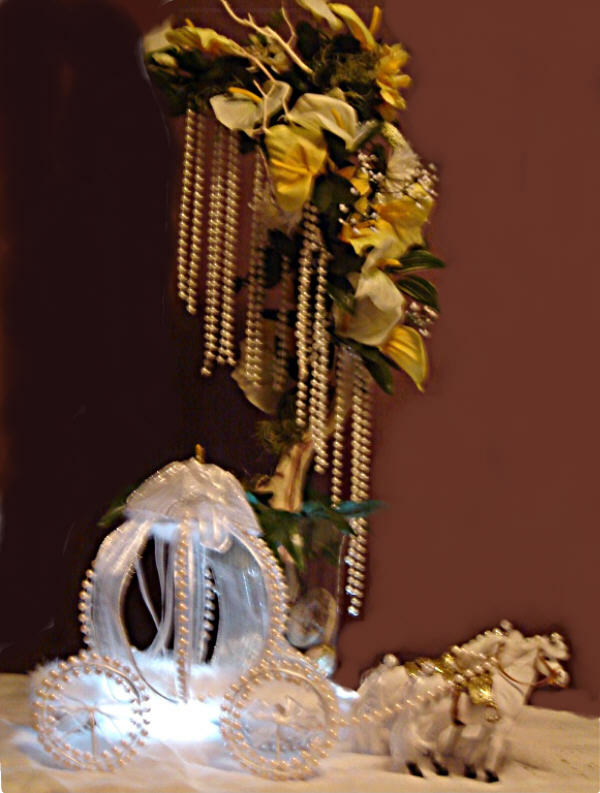 Centerpiece Price WAS $169.00(USD) NOW $149.00 including shipping (UPS 5-7 day ground) within the continental United States. Please contact us to place an order. One currently available. 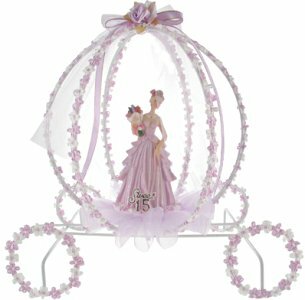 Please let us know the expected delivery month/year and the quantity if you need more than one Cinderella Crystal Pumpkin Coach. Please let us know if you would like to add a unique base or lights to this pumpkin coach centerpiece. We will be happy to quote you a price. proportionate to size of carriage. 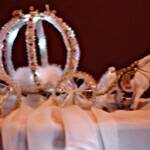 "Decorate Your Events" is a division of Royal Gift Basket Corp., Coral Springs, Fl. USA.